Well, dear readers and loyal customers, it’s official: we have our first DC Villains Month book where the demand has exceeded the supply. Batman #23.3, the Penguin issue, will not be available on the rack Wednesday morning. From allocations before the books even hit the streets, to the enthusiastic response to the motion covers, DC’s event has been an odd mix of stress and success. At Heroes, we didn’t want to make our reserve customers feel obligated to buy (in some cases) four times the normal amount of comics they would for a given title in the month of September, so we went the special order route. It seems to have worked out pretty well, all things considered, but as they say, nothing’s perfect. With so many requests still continually coming in to the store, we want to remind you that we WILL fill all requests while supplies last. These requests will be honored in the order in which they are/were received, so if you miss an issue that you requested, it simply means we didn’t have enough for everyone to have one. There is an alternative, however. 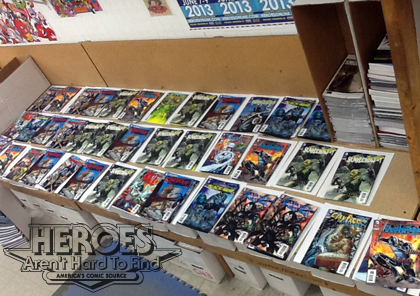 As the lenticular editions sell out, Heroes will be restocking with the regular, 2D versions of every issue. So, if you just want to read the story, and aren’t necessarily concerned with having the “hot” 3D cover, then we’ve got you covered! If you’ve requested a 3D cover of an issue and we don’t have enough quantity to fill your request, we will automatically fill it with a 2D cover when they arrive in the store. There is no need to specify; if we pull you a 2D cover and you decide against purchasing it, as always, that is totally fine. Thank you all for sticking with us through this heady and unprecedented event, and we will see you soon!